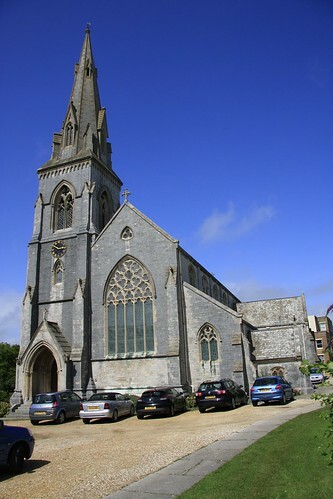 St John's Church, Weymouth, Dorset. The church was built in 1850-54 by Philip Dodson to the designs of Talbot Bury. The chosen site, at the northern end of Weymouth Esplanade, had to be purchased from the Johnstone estate. It was consecrated on 19 October 1854. The transepts were added around 1868, while the entire church was restored in 1883. St John's has been Grade II* Listed since 1953. Built largely of Portland stone, St John's has been described as having a "Decorated Gothic" style.